I think the Free McAfee Tools provide by this site are invaluable to all Computer Users in today's advanced Internet world. I too have used McAfee Stinger to help remove viruses that my normal anti-virus program can't remove. One thing I do is set the Heuristic Sensitivity Level to High and change the On virus detection option to Report Only. This is for my piece of mind. I can check every single file flagged by Stinger to ensure I can review any suspicious files before ignoring or removing. Stinger and the other tools provided by McAfee are a part of my staple eComputerZ diet! 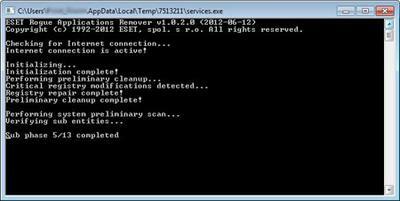 I regularly use the ESET Rogue Application Remover (ERAR). Rogue Applications (or Rogue Security Software, or Rogueware) is fake security software that deceives you into thinking you have Malware on your computer, and claims to remove it for you. Instead you are duped into installing the Rogueware which is filled with Malware that infects your computer. It triggers simulated Malware or virus attacks, Operating System problems and System Reboots. Some Rogueware even point the unsuspecting user to pay for Software that will clean these viruses or fix their computer faults. In reality they are paying for more Rogueware that will cause them more problems. To use ERAR the best thing to do is load your computer is Safe Mode. When it checks your computer it will tell you whether any Malware is detected. Note this utility is updated on a regular basis. Therefore I advise all of your readers to check the ESET website regularly and use the latest version rather than a saved copy. This type of utility goes out of date very quickly! Organisations such as Kaspersky, F-Secure and Norton release lots of free tools to help combat Malware and virus proliferation. However, Stinger is a personal favourite and I haven't come across anything else that works as well. Hello Ian. Thank You for developing your own web page on ecomputerz.com. I am intrigued by your changes to the Preferences of the Stinger tool. I think this change is a good way to double check even the slightly suspected file of being Malware. However, you could view this change as very much a Belt and Braces approach which is OK if you have the time to inspect every single file that is flagged. This is especially true of you are running Stinger regularly. I personally haven't made any changes to Stinger Preferences. I have never felt the need to as I think Stinger is a capable tool with its default settings. I would be interested to know if your changes have picked up any suspect files that Stinger with default setting did not. ESET (Essential Security against Evolving Threats) Rogue Application software is a good solid tools to help combat against the myriad of Malware propagating across the Internet today. It is one that I haven't used in quite a while. It is simple to use and is quick to scan your computer. It is important to note that this tool should ALWAYS be run in Safe Mode. It is possible that some Malware will not be removed properly if it is already active on your computer. It is also important to note that this tool can also be run from the command Prompt. This is for advanced Home Computer users who know how to add switches to the end of the EXE. this is where you can add control to how the tool behaves. For example, you can instruct the tool to run silently on your machine, and send a report of its findings to ESET Live Grid for review. It gives you the option at the end to go to the ESET Website to view the other products ESET offer. Join in and write your own page! It's easy to do. How? Simply click here to return to Computer Virus Remover.